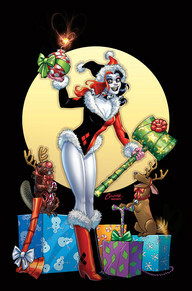 Holiday Bash with Harley and Batman! Celebrate the holidays at The Comic Bug! The Wednesday before Christmas at BOTH stores, a photo set, photographers, cosplayers, and props will be available for EVERYBODY to enjoy! Hang out with Harley Quinn at Manhattan Beach! Marvel at Spider-Gwen and Deadpool in Culver City! Photos will be uploaded to our Facebook page afterwards. ALSO, in the holiday spirit, for EVERY picture taken as part of the photo-op, the Bug will donate $1 worth of store merchandise to SCHOOL ON WHEELS, a learning center that cares for homeless children on Skid Row. Of course, ANY donation (canned foods, clothes, comics, etc. ) will be JOYFULLY accepted and also delivered to School On Wheels!